Image caption At the end of the war when fabric was still rationed, soldiers returned home with the maps and they were used to make clothes. A dress made from silk maps given to RAF soldiers in WW2 to help them find a route out of enemy territory has been sold for an undisclosed sum. 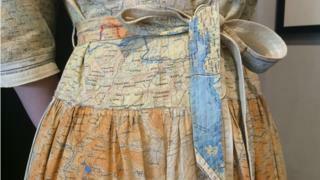 The dress, made from 'escape and evade' maps, is thought to be from 1945-50. Maps were printed on silk during the war because it is durable and was easy to conceal in soldiers' clothing. Cathy Smith, who sold the dress in Harrogate, said: "The fact that I could only locate two examples in museums suggests to me that it's very rare." Sara Jane Murray, who collects escape and evade maps and bought the dress, said: "These maps were issued to pilots and Special Forces in case they were shot down, trapped behind enemy lines and needed to escape. "Silk doesn't degrade in water and can be folded up very small to be concealed inside the lining of a uniform or the hollowed out heel of a flying boot." A British Army officer is credited with having the idea of printing escape maps on silk. Ms Murray said: "WW2 British silk escape maps were the creation of Clayton Hutton, an eccentric MI9 British Army Officer who was the genius behind so many WW2 escape and evasion aids which are still in use today. "Silk is quiet, rustle free and easy to hide or sew inside clothing."